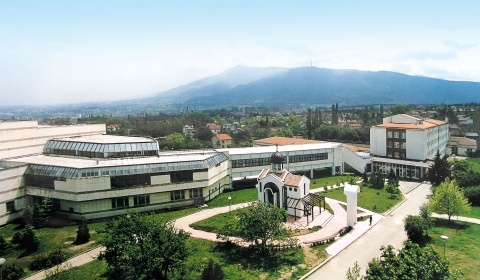 A view of the National Educational Complex of Culture, also known as the Italian Lyceum in Sofia. Interview with Velichka Velyanova, Director of the National Educational Complex of Culture, also known as the Italian Lyceum in Sofia, for the "International Survey: Bulgaria-Italy" of Novinite.com (Sofia News Agency). How long have you been in charge of the Italian Lyceum in Gorna Banya? Before that, did you expect that you would link your professional and personal life to Italy? How did this come about? I have held the position of Director of the school since September 1987, when it was known as the National Secondary School of Culture. In 1991 the idea for the Italian Lyceum was born in collaboration with the Embassy of the Republic of Italy and in particular with the ambassador at that time - Mr. Agostino Mathis - and the cultural attach? Mr. Giuseppe Santoro. Grounds for it wеre the relations we had already established with Italian institutions, since from its very foundation our school was based on the methodological principles of Dr. Maria Montessori. Our joint proposal was welcomed by the government in office at that time, and in June 1992 Decree No 87 of the Council of Ministers was adopted. Pursuant to this decree the school was transformed into a National Educational Complex of Culture with a lyceum teaching Italian language and culture with the participation of the Republic of Italy. I never expected that events would coincide this way and that I would link my professional life to Italy and its education, history and culture. This is how the school became the first and, for now, the only secondary educational institution in Bulgaria involving the official participation of another country. What impressed me at the very beginning and still does, making me think that what we did was right, is the respect, trust and understanding we have with our Italian partners. In this way with our joint efforts we have established the Lyceum which is currently among the educational institutions most sought after in our country. Please tell us briefly about the road which the Lyceum has traveled over the decades of its existence – how it evolved, what the distinct stages were, as well as its greatest achievements? In 2011 the Lyceum will celebrate its twentieth anniversary. Work in the Lyceum has been steadily laid on ever more solid foundations and ever higher requirements have been set. Since eight years ago alumni are obliged to pass an Italian matriculation exam. The criteria for admission to the eight grade have also risen significantly –general results at school and results from admission exams. We are continually improving the curriculum, whereas at the beginning this was done in cooperation with experts from the Ministry of Education and the Ministry of Foreign Affairs of the Republic of Italy. The system adopted by the Lyceum is a combination of the Italian and Bulgarian models. What are the major challenges with respect to this system? We have also had many difficulties over the years. They had to do with the differences in the regulatory systems of the two countries and with the synchronizing and adaptation of the curricula. Today the school is in compliance with both the Bulgarian and Italian standards of education and our alumni are very welcome in the Italian institutions of higher education, mainly in Milan, Rome and Venice. Higher-education institutions are pleased with our students' background and we have received repeatedly congratulations on that. Such a school model gives results and I think it is a serious step towards unified criteria for youth education in the States of the European Union. This is exactly the challenge we face and we are pleased with our achievements. Currently the Lyceum holds sixth place among the top ten schools in the country, according to the official ranking. We have many awards from national and international competitions, including the ones held in Italy. In 2010 the Lyceum received the prestigious Golden Book and Golden Seal award of the Council of European Scientific and Cultural Community. What do Italian teachers say about their Bulgarian students? And what do students say about their Italian teachers? The relations between the Italian teachers and the students are very good. Naturally, there are a few minor exceptions where students are not prepared enough, but such occasions are very rare. Bulgarian teachers receive their Italian colleagues very warmly and this is of particular importance. Have there been instances of direct contact between Italian and Bulgarian students? Would you tell us about a recent event? We have always been in direct contact with Italian schools. We have had long-term connections with the Lyceum of Science in the town of Francavilla al mare, with the Classical Lyceum in the town of Taranto, and with the artistic groups of children of the Antoniano Foundation. Now for the second year we are about to have student and teacher exchange with the town of Syracuse – a connection which was facilitated by Ms Pinello, inspector for education at the Embassy of the Republic of Italy in Sofia. What distinguishes the students of the Lyceum? Which of their features do you value the most? The students of the Lyceum are mostly recognized for their good background and excellent success rate. All of them are admitted to institutions of higher education in Bulgaria, Italy, USA, Great Britain and other states. Furthermore, due to the implemented methodology of Dr. M. Montessori and the involvement of art in the educational process, the students have a high level of intelligence and an attitude to esthetic values. I would like to use the opportunity to express my own gratitude and the gratitude of my colleagues for our fruitful cooperation with the Italian institutions and the Embassy of the Republic of Italy, and to wish sound health and achievement of even better results in our work.